Jumps for Joy: Love Me Some Kenna! Thanks to Matt McKenna, aka Kenna, for sending me this photo! 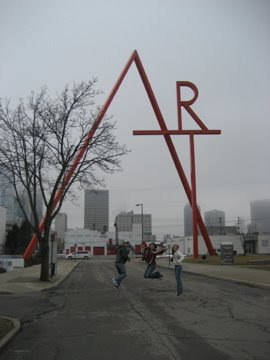 He took this picture of Jake Schafer, Tiffany Freds and Beth Prissel art jumping on the campus of the Columbus College of Art and Design (Columbus, Ohio, duh). They went to see the "Exact Imagination" and "Taking Shelter" exhibits. THANKS, KENNA!